today i bought my first sweater lot – not including the carnation pink lamb’s pride bulky from when i first started knitting that is a partially put together sweater in the frog pile. that would be 7 years of unfinished, folks. and probably a bad idea to begin with. all other sweater lots were given to me. 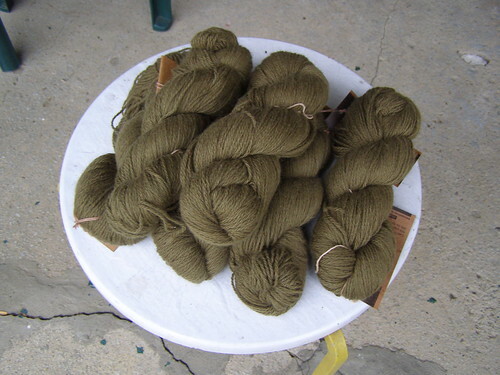 while at my local yarn store today, i could not resist this pile of dark, ugly green (ugly meaning ugly in a good way and i love it) aslan trends invernal. i am thinking i will use it to make kingscot. i’ve been waiting for something dkish weight to call my name ever since i first saw this sweater and it has finally happened. of course, i won’t have any time to knit it until mid march, but you know. it’s awfully exciting anyway! p.s. applied i-cord. before or after blocking? i’ve never done it before. any opinions would be great! This entry was posted in knitting, sweaters, yarn by cosymakes. Bookmark the permalink. Applied i-cord: Before blocking please. The application stretches just like regular knitting, so should block out with the rest of the sweater. My Tulip has applied I cord and I did it before blocking. It is beautiful. A really nice finish. I am suffering from major yarn envy right now. I’ve been stalking that very yarn since my LYS started carrying it over a year ago; it looks so darned soft and cuddly. Nice choice for your first sweater lot! oooh. and it’s on sale at my yarn store at that, maybe they’ll mail you some?!? Oh, that’s a lovely pattern. Norah Gaughan patterns make me drool! No advice for you on the i-cord though, sorry! I like the yarn. I remember that when I first bought a sweaters worth of yarn, I was rather shocked for the rest of the day. Good luck knitting your sweater. Applied I-cord before blocking. It’ll stretch lengthwise w/ the blocking if it needs to and be a perfect fit! I do all additions and seams before blocking, so that would be my suggestion. I can’t wait to see the finished product; it seems like a gorgeous sweater from all the photos and whatnot.